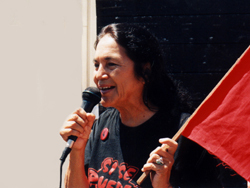 UFW Stories: "ORGANIZED BY DOLORES HUERTA"
In the mid-70’s, I was an undergraduate at UC Santa Cruz. While I came from a family of revolutionaries and union activists, this was still mostly theory to me at that age. Then Dolores Huerta came to campus, to recruit volunteers for the UFW summer campaign. Moved by Dolores’ animo, I decided to put my ideals to the test, and stood up to volunteer. (This has a soundtrack added by my son, whose mother I met in the first UFW campaign - one of many UFW romances). After helping out at negotiations, I also worked as a farmworker for unionized employers. I got the easy jobs - thinning apples and quality-control at another mushroom farm. I did become a lawyer, and began serving farmworkers in that capacity for California Rural Legal Assistance, in the Imperial Valley. From there, I returned to Los Angeles, and have been practicing law for workers, unions and union funds, ever since. You can see more videos about farmworkers on my You Tube channel - youtube.com/user/JDSackman, including a banned film of a 1947 farmworker strike where Cesar Chavez got his first union card, and film of farmworkers living in boxes and holes in the ground in the 80’s. It was Dolores who set me on the path I continue today. Has much changed from our efforts? I hope so. LA LUCHA SIGUE !